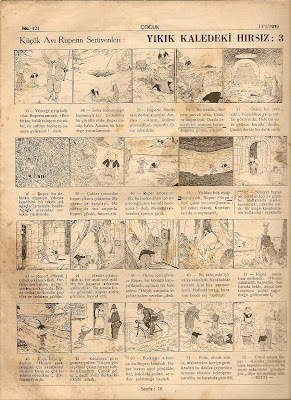 The ever-popular British comic strip Rupert Bear, created in 1920 for Daily Express and still running today!, was serialized in Turkish children's magazine Çocuk in the late 1930s as 'Küçük Ayı Ruperin Serüvenleri [The Adventures of Ruper the Little Bear]'. The above scan is from no. 121, dated Jan. 13th, 1939, and features the third and concluding installement of an episode titled as 'Yıkık Kaledeki Hırsız [The Thief at the Ruined Castle]'. Rupert Bear was created by Mary Tourtel (1874-1948), the wife of Daily Express' editor. The episodes reprinted in Turkey are probably by Alfred Bestall, who had taken over in 1935.